Gathering at The Law Society of Ireland earlier this month for Legal Cheek’s first student event in the Irish capital, ‘The rise of Dublin as a global legal centre’, were: Marilyn Cooney, a senior associate at Pinsent Masons; Declan O’Sullivan, a partner at Dechert; Tara Doyle, a partner at Matheson; and Chris Jorgenson, legal manager at BARBRI. 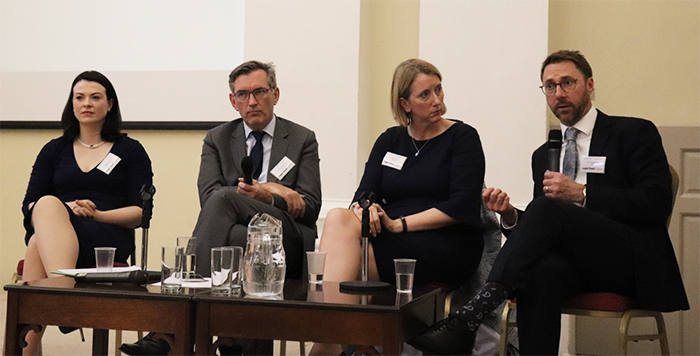 They had a lot to say, on topics ranging from Brexit, the Irish legal market and the merits of international legal market qualifications — including the Irish, English and New York route, Aishah Hussain reports. Driven by a resurgent economy and the aftermath of the Brexit referendum result, Dublin is emerging as a location where a number of leading UK and US law firms are looking to establish a presence. Dechert was the first US firm to enter the Irish legal market over eight years ago, while London-headquartered Pinsent Masons opened in Dublin just nine-months ago. It was a strategic decision in line with the firm’s long-term growth plan, explained Pinsents regulatory funds senior associate Cooney, but one that was “accelerated” by the Brexit vote. As the shadow of Brexit looms, it’s likely that Ireland will become the only English-speaking common law country in the EU. Doyle, who heads Matheson’s asset management and investment funds group, explained the benefits of this. “English is the language of international business and common law is the governing law of most international trade. Ireland has spotted an opportunity — to have Irish law governing the law of contracts and Irish courts as the centre for dispute resolution,” she said. There may have been a significant increase in the number of global law firms seeking to establish a foothold in Ireland. But it’s not the case that domestic law firms will have to strategise and compete with their potential rivals across the Irish Sea. Instead, these firms aim to disrupt rather than damage. Doyle said Dublin-headquartered Matheson (which has been established in the capital since 1825) is welcoming the internationalisation of the Irish market. “It’s good for Ireland’s status as a global legal centre to have international firms operating in the jurisdiction,” she said. There is, however, the pressure to retain homegrown talent. Foreign entrants to the Irish legal market haven’t to date brought additional personnel with them, Doyle explained. This means Irish lawyers are likely to be headhunted by the firms coming in. There is a general shortage of solicitors in Ireland. This presents an opportunity for English and Welsh undergraduate students, many of whom are applying for training contracts in a fiercely competitive and oversaturated job market. The Irish legal market is often overlooked. Doyle said Matheson receive around 800 applications for their internal trainee lawyer programme each year and “no more than half a dozen” come from non-Irish universities. Other firms are taking a proactive approach to ensure they have a steady stream of lawyers coming up through the ranks. Last year saw Dechert offer its first training contracts in its Dublin office. A graduate recruitment programme has just been launched at Pinsents’ Dublin arm and will take on four trainees from as early as next year. The cross-border aspects of law in today’s society has given rise to dual-qualification in another jurisdiction. “Before there were around 200 English solicitors opting to dual-qualify in Ireland. In the past year, that number has jumped to 1,200,” said Jorgenson, a US attorney who practised in civil litigation before moving to head BARBRI’s international bar review. Irrespective of Brexit and any changes in the solicitors’ qualification in Ireland, the dominance of international law firms continues on both sides of the Atlantic. Future lawyers with international qualifications and experience will be more attractive to the global law firms as they seek to invest in Dublin.